What is hot in China’s venture capital land nowadays besides artificial intelligence? The answer: autonomous driving. Back in 2015, when the Chinese government issued its China 2025 blueprint, it named autonomous driving as a key sector for the nation’s technological and economic future. VCs have responded by crowding into the sector. Over the past ten months, Chinese investors have made eight major deals worth over US$280 million, according to data from China Money Network. VCs are backing an industry that will see significant growth over the next few years. The Chinese intelligent driving industry is estimated to reach RMB121 billion (US$17 billion) by 2020, according to Chinese research firm Analysys. Besides venture capitalists, the biggest investors in the sector are the so-called BATs: Baidu, Alibaba and Tencent. In fact, the biggest deal on the list was when Baidu Inc. teamed up with Ford Motor Co. in August 2016 to invest a combined US$150 million in Velodyne LiDAR, Inc., a supplier of technology that lets self-driving cars see and avoid what’s around them. The BATs are also investing hundreds of millions of RMB into their own autonomous driving business units, which they see as an important data platform and distribution channel in the future. 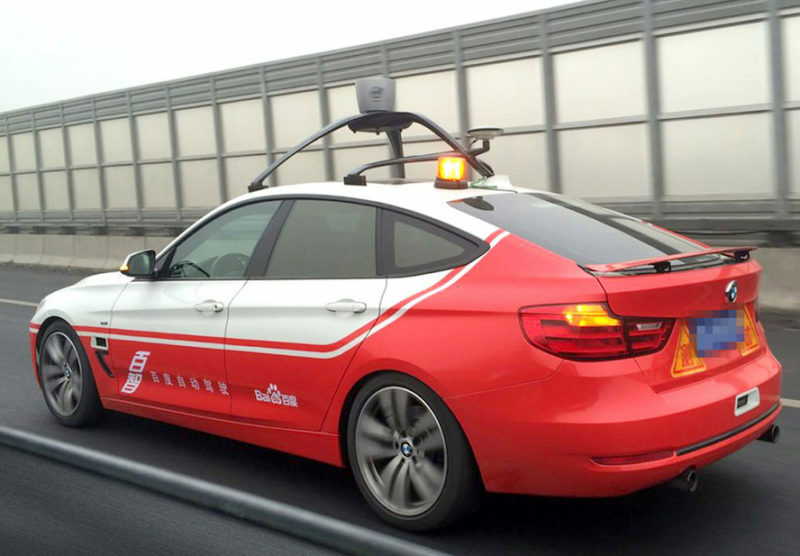 Baidu, the most active of the three, established its autonomous driving business in 2013. Alibaba established a US$161 million Internet of Cars Fund with SAIC Motor Co Ltd. two years later, and also set up its own autonomous driving unit that same year. Tencent, always the follower in its pursuit of emerging technologies, established its automobile business department last year, and acquired a 5% stake in U.S. electric vehicle maker Tesla, from which it hopes to gain insights into the future of transportation. Here are the eight major deals done by Chinese investors in the autonomous driving space during the past 10 months. June 2017: Shunwei Capital joined a RMB100 million (US$14 million) series A round in AI-Drive, a Chinese autonomous driving solutions provider focused on unmanned logistics and unmanned aerial lift vehicles. May 2017: GSR Ventures joined a US$25 million series A round in DeepMap Inc, a U.S.-based start-up co-founded by a Chinese engineer, developing high-definition maps for autonomous cars to navigate in complex and unpredictable conditions. May 2017: Pagoda Investment led a RMB110 million (US$16 million) series A round in Hesai, a Shanghai-based company developing smart sensing solutions for autonomous cars and natural gas leak detection systems. May 2017: Hangzhou-based chip maker Canaan raised RMB300 million (US$43 million) in a series A round from a number of investors including Chinese hotel operator Jin Jiang International Group Co., Ltd., Chinese investment firms Baopu Asset Management Co. Ltd. and Tunlan Investment. April 2017: Baidu acquired xPerception, a U.S. technology company, providing visual perception software and hardware solutions for a range of applications, including robotics, virtual reality (VR), and devices for people who are visually impaired, in order to push the development of augmented reality (AR), autonomous driving, and artificial intelligence-based products. March 2017: Alibaba invested US$18 million in WayRay, a Swiss holographic augmented reality company developing AR-enabled car navigation systems for Internet-connected vehicles. February 2017: Legend Capital led a RMB100 million (US$14 million) series B round in Chinese self-driving tech firm Zongmu Technology, which develops advanced driver assistance systems, including 2D and 3D panoramic vision system, self-parking solutions, and driving recording systems. August 2016: Baidu Inc. and Ford Motor Company invested a combined US$150 million in Velodyne LiDAR, Inc., a supplier of technology that lets self-driving cars see and avoid what’s around them. December 2016: An incubator under JD Finance backed Hangzhou-based bike and self-driving car start-up Notebike to jointly develop an autonomous vehicle specifically designed for goods delivery. June 2017: Northern Light Venture Capital and Legend Star entered the industry by participating in an angel round worth tens of million of RMB in advanced driver-assistance systems and autonomous driving technology developer Qingzhi Technology.